I am here or there, or elsewhere. In my beginning. We went to the beach today, Stephanie and I. Our Wallace and Pushkin needed a little sun. A slightly wrong turn got us a little lost, but we arrived at a much quieter beach than we intended, with no lifeguard which meant freedom to swim out past the buoys. We shared the sand with a few nannies and their kids who fished in the sea weeded parts of the lake. We floated. Swam out past the buoys and laid back against the still water. Little tufts of cotton floated past in the blue blue sky. Suspended for a moment--cut off from your surroundings, the only thing you are aware of is your own breathing and the emptiness below you. A swim back to shore, some cold crescent moon pizza, a few more pages read of Jest and we're back at 1300. My skin smells like lake and sunscreen. My copy of Jest now has sand stuck in the creases between pages, when I open it I can hear the faintest crunch. I woke up this morning not by alarm or chance. Instead, I felt the temperature climbing in the early hours of the morning and peeled back the layer of covers I had put on some time during the cool(ish)ness of the evening. My weather.com icon on my desktop blinked and the automated thunder claps (which still make me jump) crackled through the speakers. The large words: HEAT ADVISORY were all I needed to read. Staying inside our non-air conditioned home would not be an option today. 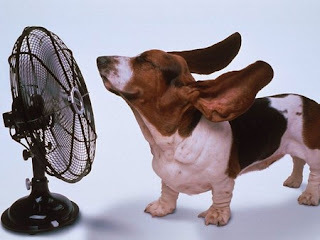 And unfortunately I don't have to the stamina to put up with the heat or to rest in front of the fan like our basset hound friend to the left. The immediate conclusion then was to retreat to the air-conditioned apartment of our dear friend Britta. Jillian and I packed up our books, computers, and movies to camp out indoors for the day. We are lucky to have friends that a) can afford such luxuries and b) don't mind sharing those luxuries in exchange for nothing but company. We feasted on pizza with pineapple and green peppers (thanks Jillian) and watched Revolutionary Road. A film of social stiflement and emotional entrapment felt fitting when we ourselves were feeling stifled and trapped (by the humidity that is). The film was honest and filmed with a quiet but unsettling simplicity. Beautiful performances from both Kate Winslet and Leo DiCaprio. It probed into the lives of a seemingly perfect 50s suburban couple, whose veneer unravels as the film progresses. When faced with a life we didn't envision for ourselves, do we fight to find hope or do we let the emptiness consume us? The day's activity (or rather lack-thereof) has left me feeling exhausted. It is strange to feel fatigue after doing nothing but lounging all day. I realize now how much we are built to work, or at least built to have a balance of work and rest. Having all this rest and free time (a gentler way of saying "I am unemployed") has had its perks, but I admit I'm anxious to find something to DO. I don't know how long this "sabbatical summer" as I've called it will last. So far the progress I had hoped to make hasn't happened. I have been distracted this week by circumstances out of my control and haven't felt myself for the past couple of days. Perhaps when I leave this funk I'll find some motivation to start the dreaded job hunt. I'm trying. And for now that will be enough. The trying. So here is my attempt. My raid on the inarticulate you might say. I've enjoyed reading others' blogs, but have never felt the urge to keep this one going. I guess I haven't found much blog-worthy material in my life as of late. But then again who is to say what is blog-worthy. These days anyone with a creative mind (or lack there of), access to a computer, and a load of free time on their hands can call out their thoughts into the endless cyber-space. Here I am in the middle of my way, post-grad, new to the neighborhood of northeast minneapolis, unemployed, embarking on.... whatever comes next. Seems like a good time to pick up a new hobby. Knowing my restless self, I'll abandon this venture in a few months for a new one, baking perhaps? or crocheting? We shall see. I hope I can persist. This is my end becoming a beginning. ps--I hereby swear to not be so quote-heavy with t.s. eliot in the future, at the moment though his words are on my brain and seem a good subsitute for my lack of words. feel free to keep me accountable to this promise.